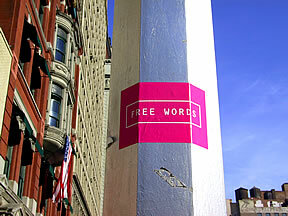 HAVE YOU FOUND OR PLACED FREE WORDS? Exciting news: Free Words Forever will be the inagural volume of the new Free Press library. This summer and fall you are invited to contribute to the creation of an open-access publishing house, a "Free Press," to be launched at Röda Sten contemporary art center in Göteborg, Sweden. A project of artist Sal Randolph, Free Press will accept all kinds of writing from the public; contributions in any language can be as short as a single word or as long as an encyclopedia and can include manifestos, statements, documentations, studies, stories, recipes, poems and whatever you can imagine. "Even in the age of the internet, book publishing is a walled garden where editors and commercial interests filter out most of what is written," says Randolph. "To publish is to 'make public,' and the published materials of the world create their own kind of public space, a city of books where readers and writers are citizens. Free Press aims to open up access to that public space. Like any city, Free Press is bound to include both ugliness and beauty, though the definitions of each will certainly differ." All participating manuscripts will be published as printed books in the Free Press series, available in the project's library and reading room at Röda Sten, where events and discussions will also take place. Additional copies will be placed on shelves in local bookstores and libraries. Readers will be able to download copies from the website and order them at cost from an internet book printer. Friends of the Free Words project and contributors to Free Words Forever (formerly "Free Words 2") are warmly invited to add their texts to Free Press. And of course you can add as little as a single word, and help create Free Words Forever. This is an article about adipex-p for sale review. Phentermine 37.5mg is commonly available from pharmacies around the world.